The Howrah Bridge in the Indian City of Kolkata (Calcutta) is in danger collapsing not from vandals, weather or natural erosion, or even age but from spit. Paan also known as betel nut is a mixture of betel leaf, areca nut, and slaked lime which is chewed. Chewing betel nut is a favourite occupation of Indians. It is a mild stimulant similar to nicotine that produces in the user a calming warm sensation in the body. The dark red mixture is chewed rigorously before being spat out. The mixture is deeply corrosive to steel and has manage to corrode away the bottom of the metal supports .reducing them from 6 millimetres thick, to just 3 mm. 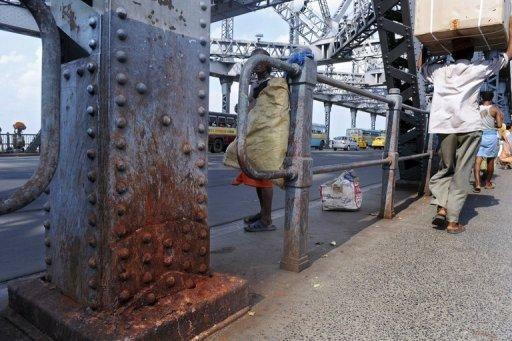 “The thickness of some of the hoods has halved in just three years, It’s a real concern, and may even require closing the bridge for repairs,” says Amal Kumar Mehra, a chief engineer with the Kolkata Port Trust which is responsible for the bridge’s upkeep, speaking to AFP. “The accumulation of spit laced with this compound can have an acid-like effect on steel and gradually eat into the structure,” said Chandranath Bhattacharya, director of Kolkata’s Central Forensic Science Laboratory. If they supports continue to erode, the whole bridge is in danger of collapsing. The authorities are now looking at ways to prevent further damage – one option is to cover the steel in a fibreglass casing.